A Japanese couple takes several selfies in front of the Hitachi tree. 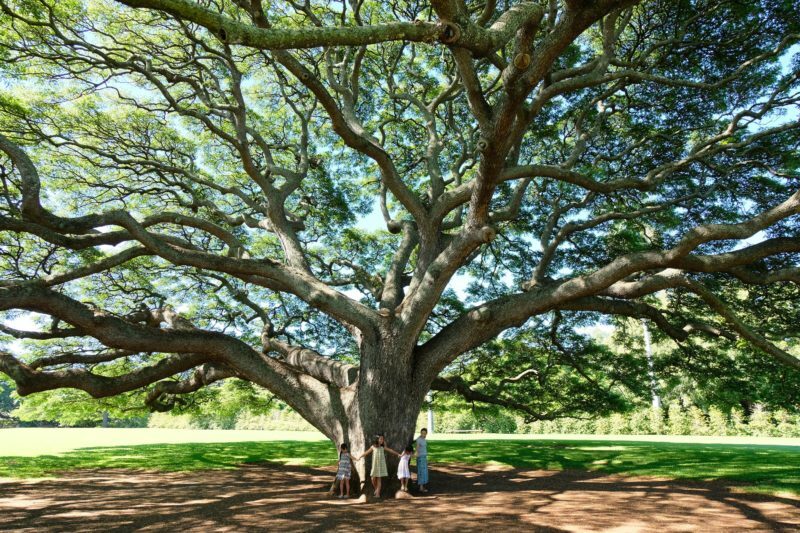 There is one famous tree in Hawaii that I would guess 99% of all Western visitors do not know exists. Only my Japanese friends have asked me to take them to see “the tree”. Imagine their shock when they realized I had no idea what they were talking about. Hah! What makes this particular tree special is the story behind it. Back in 1973, Hitachi (yes, that huge global Japanese company) bought exclusive rights to the tree and have since used it in their branding to promote the Hitachi identity, in particular, their famous “inspire the next” slogan. Over the years, Hitachi has managed to tie itself to the Japanese community through their efforts to be reliable and earth-conscious. Children grew up hearing their commercials and their “inspire the next” jingle. Their success has been so great that Japanese tourists make the trek from Waikiki to Moanalua – a city that’s not usually on the average tourist’s itinerary. And what a tree it is! Monkeypod trees grow everywhere in Hawaii, but the Hitachi tree is one of the finest on the islands. It’s certainly worth a look because when you see it in person, I think you’ll be hit by that same “wow” factor that I’m sure those very first Japanese businessmen experienced. What Is So Special About The Hitachi Tree? Most monkeypod trees in Hawaii are smaller than the Hitachi tree. In my own neighborhood, they grow on medians and sidewalks like dominos, purposefully kept small by each other, the asphalt and a trim when they get too close to the telephone poles. They’re a favored tree for soccer field parks and are free to grow large. On weekends parents and players huddle under their shade for the after-game potlucks. 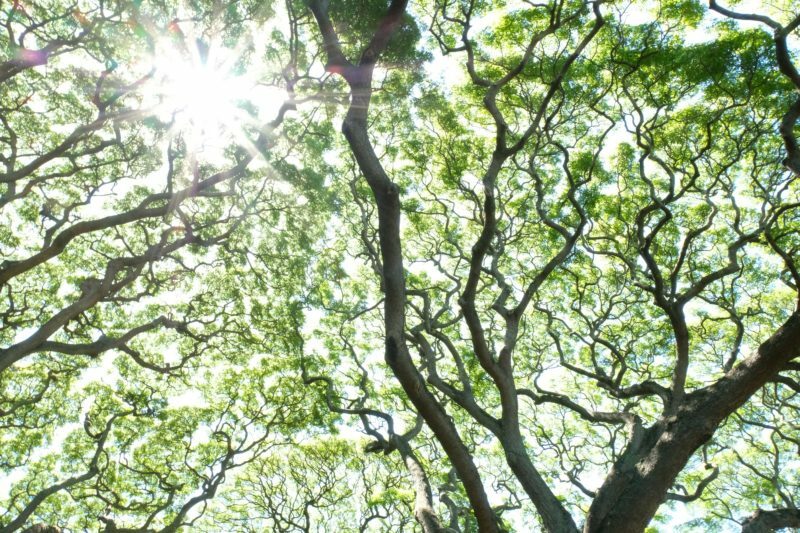 The Moanalua Gardens provide space for the trees to stretch their limbs. Here, the monkeypod trees have grown without restraint and without boundaries. Calling these trees “huge” falls short of their presence. Their branches stretch up, out and so far that the tree reminds me of a small green hill. But if you can believe it, the Hitachi tree trumps them all. I strolled outside of the Hitachi tree, walking the line between sun and shadow. The branches were so low in some areas that I had to duck down to avoid hitting my head. Wispy flowers that looked like pink fireworks bloomed everywhere and I stopped at every flower that was eye level to practice my photography. When I had done my round, I ducked once more, but this time into the shade and for those few moments I had entered a hidden room. The feeling was like standing in a large auditorium alone where the AC was turned off and the people long gone. Every sound I made was magnified – my breathing, my steps, my silence. Despite the loud quiet, I could still hear the happy tourists taking selfies just outside the tree, the wind blowing between branches, and the rushing cars on the freeway that borders one side of the Moanalua Gardens. But all that noise was muffled and barely noticed. Walking under the canopy was like walking in a spacious treehouse. Because the branches blocked my view to the outside, I felt like I was standing in the tree. The branches were my staircases and at any moment I could become Tarzan and swing and jump my way through. Luckily, most of the branches are safely out of arm’s reach and the inside is shaped like an umbrella. And that clean air. If you have a chance to breathe it in, go for it. It’s clean, fresh, cool. I would rate it as somewhere between an early morning’s sea breeze and a well-earned inhalation at the top of a mountainous hike. Local Tip: Although the Hitachi tree attracts many Japanese visitors, don’t start thinking that this is a crowded tourist attraction. It isn’t. I saw only one tourist bus while I was there and a couple of those smaller private tour vans. When I first entered Moanalua Gardens, there were less than 20 Japanese tourists taking selfies with the Hitachi tree. And when I left about 2 hours later, the crowd size still hadn’t changed that much. A family barely wrapping around half of the trunk. Standing underneath felt like I was carrying the world's largest (and lightest) umbrella. When I first arrived, one local family made a beeline for a shady spot right in the middle of the park. They certainly knew their way around. They had a fantastic view of the Hitachi tree in front of them, the pond of ducks and fish was off to their right and they sat in some great shade with excellent reclining furniture. Yes, you read that right, furniture. Moanalua Gardens surprised me with how many beautifully carved wooden chairs, tables and benches there were. Almost every large tree had someplace to sit and I found a nice, shady spot to sit and recline next to a cluster of palm trees that blocked those UV rays. Everything was made from large tree trunks – the kind you see in impressive museums or at someone’s house. But these all pale in comparison because everything at Moanalua Gardens is larger than life. The longest bench I found was occupied just by 2 ladies having a private discussion on the far end of the gardens. The bench was about 30 feet long and looked like a large branch that had been sanded down and polished to a gleam. The bumps and knots were still there, but the core shape remained. It even branched off into a “Y” and would have been perfect as a mini-jungle gym for young children. The recliners were the best though. There were several dotting the lawn and it was so nice to truly sit back and relax in the shade even if you didn’t bring a towel or picnic mat with you. Local Tip: My favorite was a desk-shaped piece with the seat and tabletop made from the same cross-section of a trunk that was at least 5 feet in diameter. If you find it, let me know! The view from below the Hitachi tree. The admissions office at the entrance of Moanalua Gardens is both a souvenir shop and refreshment stand…for humans and the local animals that live here. You can buy a bag of food for the fish and ducks and children will enjoy themselves at the pond. Interestingly enough, I didn’t see any pigeons, which is great. They tend to flock and make a mess whenever there’s a reliable food source around, but I guess the ducks have enough of an attitude to keep them away. There were at least 20 ducks at the pond (I spotted a handful at the stream that wraps around Moanalua Gardens) and although they stayed in or near the water, they didn’t surround any children to beg for food. In fact, there was only 1 duck with no inhibitions that came right up to the children – a lame duck with a bad leg. Easily understandable and of course it got an extra handful from everybody. 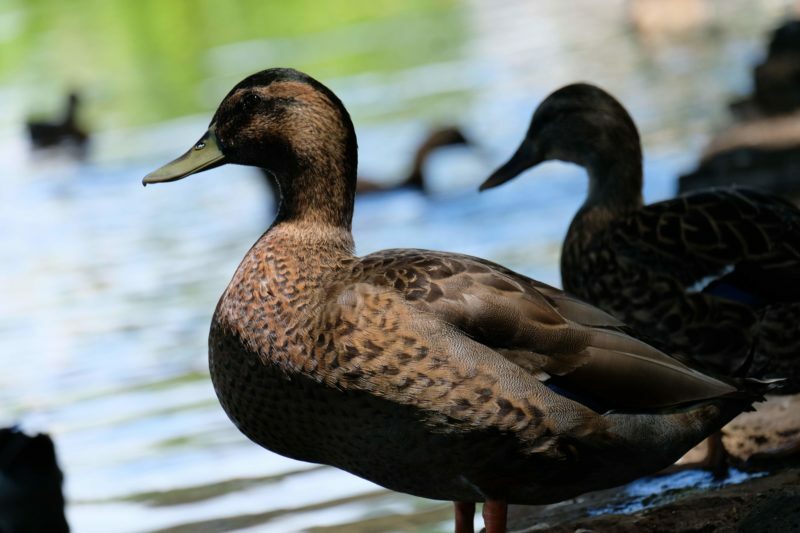 Local Tip: You can feed the fish and ducks at the pond, or you can save your food for the stream. There’s a spot further towards the back of Moanalua Gardens from the pond where there’s a cement bridge and deep water. I saw plenty of tilapia and a family of ducks out in this area. I even saw a mongoose while I sat down and shot some nice pictures! I loved how this photo came out, the duck is shrouded half in darkness, which only adds to his wariness while watching me fumble with my camera. The Moanalua Gardens pathway doesn’t go around the whole park. Instead it runs along the back, parallel to the stream where there are plenty of fruit trees and flowering plants. I saw (and smelled) mangos and plenty of breadfruit trees along the way. There were even several fruits that I could not name. One green fruit about the size of a peach even reminded me of a cute baby’s bottom – it had 2 cheeks and even a dash of pink. Even though we’re entering fall season, the flowers were gorgeous and blooming. I saw a range of bright pink, yellow and white flowers that were beautiful dots of color in a forest of green leaves. The wind was a constant breeze and it was pleasant to see the flowers bow and wave with each gust. In the middle of the pathway there’s a very, very old house on a small hill right above the pathway. It doesn’t look like the house is occupied, but who am I to judge? The house looks like the next hurricane will blow it over, but so far it’s managed to hold on tight. Old pieces of rope dangle from the house and many of the wooden slats lay haphazardly at an angle. While this broken house may be ignored by most, I felt that this dwelling had a story to it and couldn’t help but wonder at its obvious history. It would be neat to find out how this house at the edge of Moanalua Gardens ended up there! A couple strolls and laughs as they walk and enjoy the path. I spoke to a young lady at the admissions office and although she couldn’t offer any extra background info about the park, she did tell me that one of the original owners was a collector of buildings. A very interesting hobby that I think most people can’t afford. The quaint home trimmed in teal with a beautiful view of a taro patch was actually Prince Lot’s summer home (Kamehameha V). Before I came here, I didn’t know that this house belonging to royalty existed. So it was a pleasant surprise to learn about this historical gem as I journeyed through the gardens. Unfortunately, you can’t go inside. The entrances have a chain labeled “kapu” meaning prohibited or taboo. I did see one caretaker go inside though so it looks like they still put a lot of effort into its upkeep. The other building to see is the Chinese Hall. 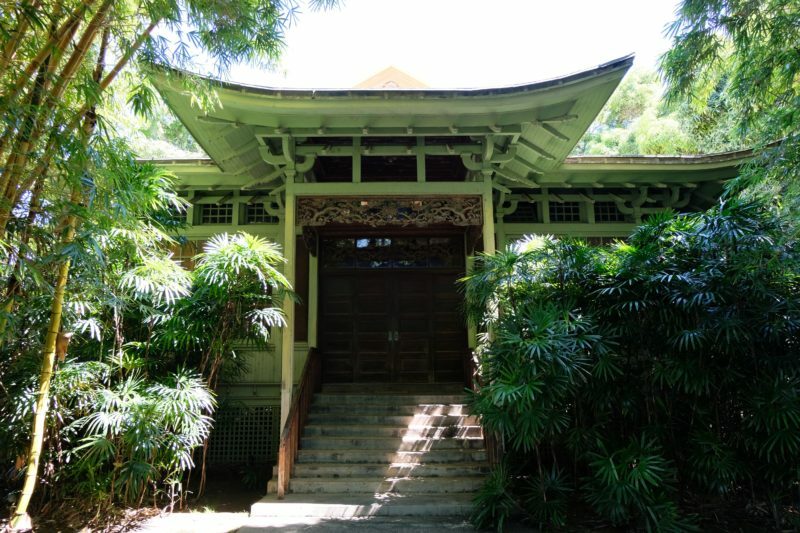 The hall is originally from China and was shipped to Hawaii in the early 1900s. Back in the day, the Damon family entertained in this hall and it could fit 300 people! I wish I could at least walk around the building because it’s hard to imagine that many people cramming in there. The intricate wood carvings running underneath the eves is what really caught my attention. The phoenix and dragons are obvious, but I also spotted lotus flowers, which are all important in the Chinese culture. A Local Story: I took a picture for a Mom and her 2 daughters. She explained how her parents were married at the Chinese Hall and she wanted her daughters to have that connection with their grandparents. I thought it was a lovely story especially since the Chinese Hall is rarely open these days. Prince Lot's summer home overlooks a calming taro patch and fish pond. The entrance to the Chinese Hall lies just on the other side of the fish pond. Moanalua Gardens has a kamaaina price of $1 per person as long as you have your Hawaii ID or Hawaii driver’s license to back it up. For everyone else, it’s $3 per person and free for kids under 12, which is still affordable since you’ll spend at least 2 hours there walking and exploring. Do not pick any flowers or fruits. There will be signs everywhere about this. Picking the fruits and flowers not only takes away the beauty from other Moanalua Gardens’ visitors, but also interferes with the wildlife that relies on those flowers and fruits. Don’t climb the trees. 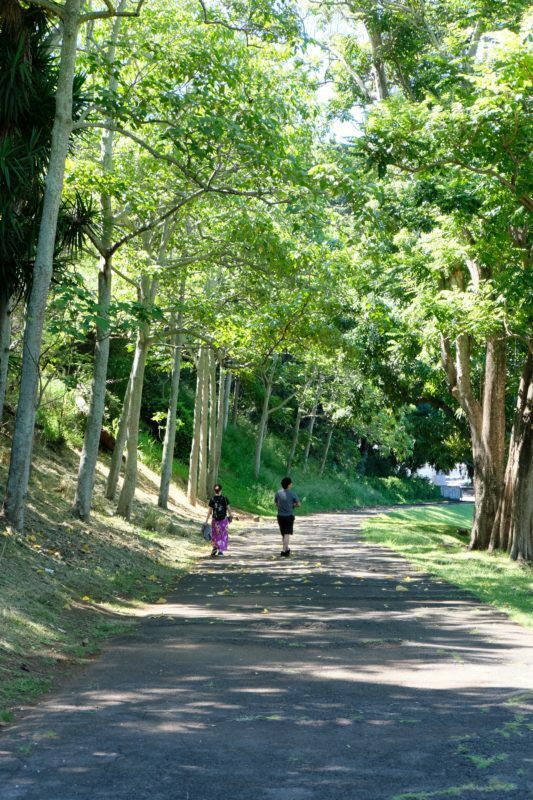 Seeing such huge trees may be tempting, but treat Moanalua Gardens like a botanical garden. Children are free to climb the benches, walls, and large stone decor. The hours are from 7:30 AM to 30 minutes before sunset. In addition to the Hitachi tree, 2 other monkeypod trees and a bodhi tree have been titled “exceptional trees” by the city, which means they can’t be moved or destroyed without the city council’s approval. You can rent Moanalua Gardens for an event, wedding or even vow-renewals. It’s a beautiful place for any celebration. Moanalua Gardens is privately owned by J.P. Damon, great-grandson to Samuel Mills Damon, the original owner to Moanalua Gardens. Will You Be Visiting Moanalua Gardens For A Hitachi Tree Viewing? Isn’t this a gem of a find? 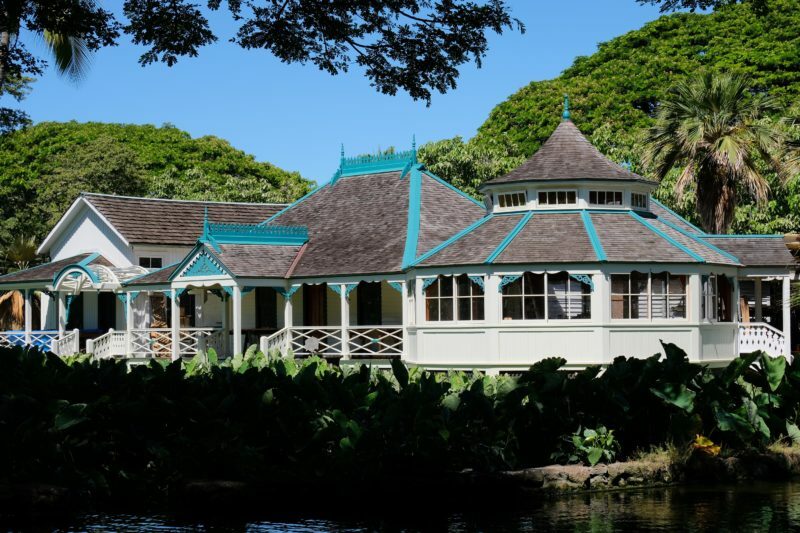 Moanalua Gardens is a gorgeous piece of land and we’re so lucky that the private owner has continued to keep access to these beautiful grounds open to all without hijacking the price. There was a mini scare a few years ago when J.P. Damon purchased the land for $5M because although the gardens had been open to the public since 1924, it remained unsure that it would remain so after the purchase. Luckily, J.P. Damon wanted to keep the park open to the public and my fingers are crossed that future owners will want to do the same. 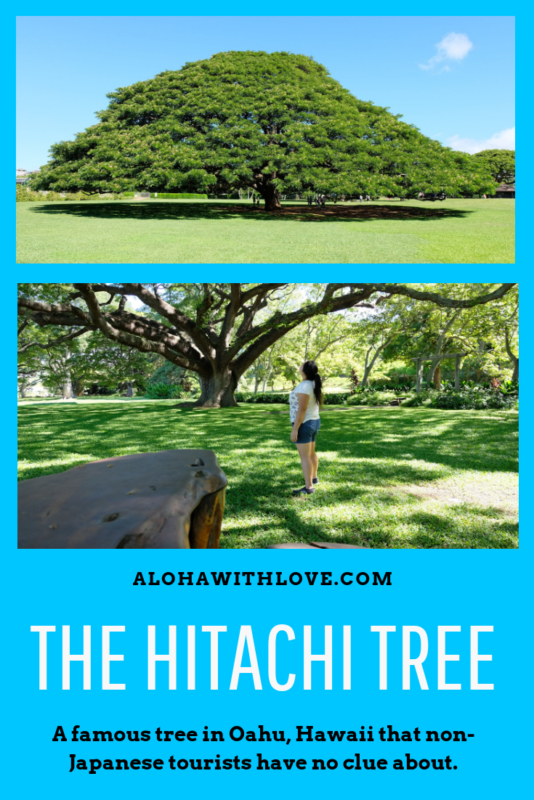 If you enjoyed this article about the Hitachi tree at Moanalua Gardens and plan to visit Hawaii someday, sign up below to get my local Hawaii tips. It’s free and I can’t wait to help you plan the perfect Hawaii vacation.